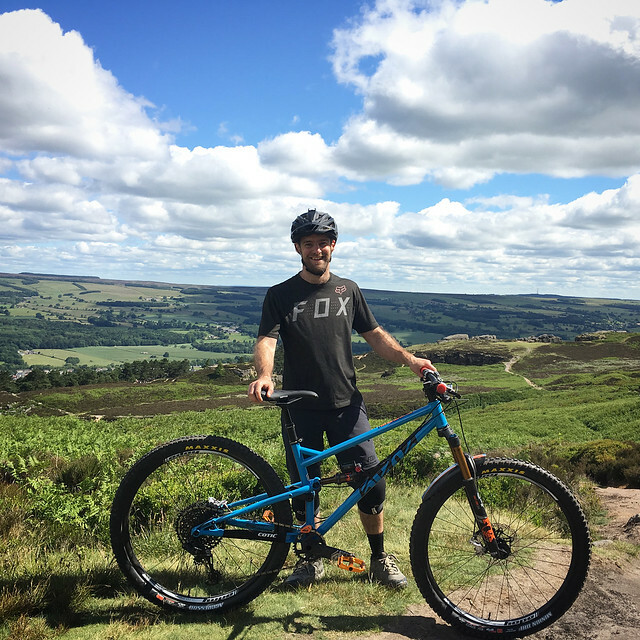 Our new ambassador Chris Hall, creator of the awesome Downtime podcast, has finally got himself a Cotic and "stoked" would be an understatement. Here's his story and some details of his mega-build. Ok, I’m British, and I’m nearly 40, so sticking with the stereotype, I’m suspicious of change! I guess that’s why I’ve not had a 29er until now. My first, and only previous experience was on a Specialized 29er hardtail hire bike, on a short ride during a trip to Australia. Plastic pedals and regular trainers meant that staying on it was pretty much the only thing on my mind! So it wasn’t really until my recent podcast with Cy (www.downtimepodcast.com/cy-turner/) that I started to wonder about giving one of these new fangled 29ers a go. So a few weeks later, I arranged to got for a ride with Cy on their demo Flare MAX, fitted with 29er wheels. Immediately, sitting stationary on the bike, things felt very different. The front wheel looked huge, and a long way away... but we got the suspension dialled in, and headed for the hills. Once I was moving along, it felt much more like a bike, and not that strange at all. By the time we had done 30 minutes of climbing, and got to the first downhill section, I was feeling pretty at home. So much so that I mashed on the pedals and hit the first proper section of the ride at warp speed, launched into some rocks, and immediately got caught out by a little less rebound damping than I’m used to, and blew a foot off the pedals (I ride flats). All was well though, and with an extra click of high speed rebound damping, we headed on to Jumbles Road. This trail is fast, full of loose fist sized rocks, and it’s going to hurt if you come off, to put it simply, it’s not my kind of trail. However, the Flare MAX took it all in it’s stride, and felt stable, planted and controlled. It’s the closest I’ve ever managed to stay to Cy down that trail, and I’m sure the fastest I’ve ever ridden it, but it felt 100% safe and in control. We finished up the ride with a descent down a very wet and water damaged trail called Devil’s Elbow. It’s a little steeper in places, with lots of line choice and plenty of slippery rocks and roots to catch you out. Definitely more technical than Jumbles Road, and requires a good eye for the right line along with a good dose of riding skill. Cy is insanely quick on this trail, and staying anywhere near him was not happening. So that left me and the Flare MAX for some quality time together. The bigger wheels made rolling over the rough stuff a bit easier, and the relatively slack head angle and long front centre meant that you never felt like you were going to go out the front door. I’m fairly sure the bike let me get away with a couple of moments that I wouldn’t normally have survived, so by the time I got to the bottom, I had a big grin on my face and was working out how I could build myself one. Thanks to some amazing people, I’ve managed to put together a really special build. So I owe a massive thank you to Cy for the frame, groupset and post, We Are One Composites for some very special carbon wheels, Jordi at Fox for the shock and forks, Hope for the brakes, headset and seat clamp, Burgtec for bars, stem and pedal, Mudhugger for a nice matching mudguard, WTB for the saddle, Maxxis for the tyres, and Ard from Kogel for a pretty special ceramic bottom bracket and Jockey wheels. I am a very lucky boy! So I’ve had the bike a couple of weeks now, and a lot of you have been asking how I’m getting on with it. Let’s just say, I’m very happy! To start out with I’ve kept set up simple. I’ve dialled in sag, and put the high speed rebound settings at the point Fox recommends for those pressures. Low speed compression is currently set in the middle of the range. I’ve also added an extra token into the fork (standard is 3, I have 4) as I like the fork to ramp up a fair bit. With so many changes from my last bike (wheel size, travel, geometry etc), I wanted to get used to all of that first before I really start to do any significant tuning. First impressions are great, considering the amount of changes I’m working with, I already feel very comfortable on the bike. The effect of the longer bikes for me makes me feel like I am ‘in’ the bike, rather than ‘on’ the bike, if that makes sense! 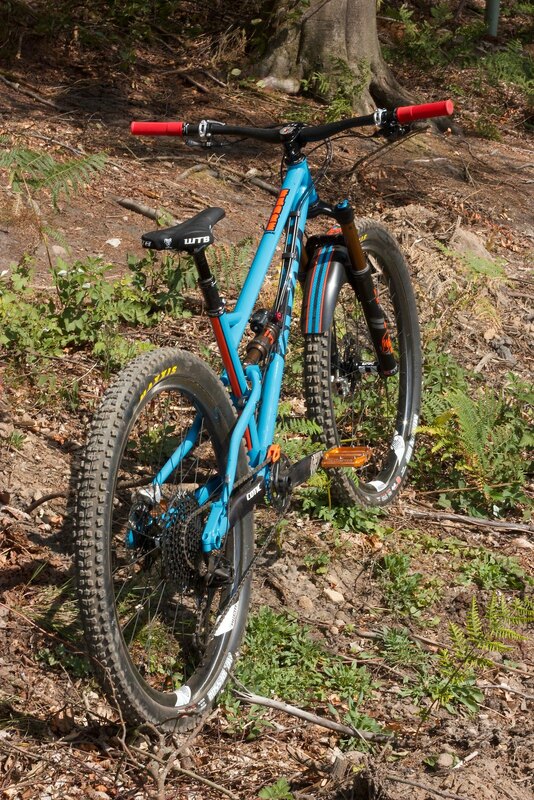 I feel like I am more at one with it, and the length seems to naturally put my weight very centrally over the wheelbase, giving a good balanced ride and predictable grip. The ride feels lively, but composed, and I have to say that I haven’t yet found any downsides of the modern take on geometry. The larger wheels means that the bike picks up speed like nothing I’ve ever ridden, making easy work of rough bumpy straights, and it really doesn’t feel like it only has 120/130mm travel. I’d say it feels similar in travel to my Transition Patrol at 155mm when you’re pushing on, but more sprightly and light at the same time, as you’d expect from a shorter travel trail bike - a real grin inducing ride. 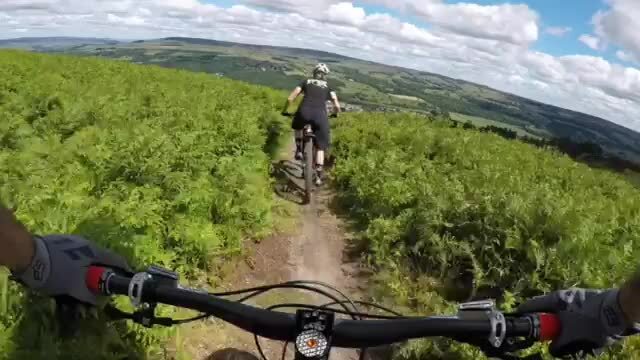 The flip side of that is that you can end up hitting some really rough stuff very fast, and then you don’t quite have that ability to get away with things as much as you can on a longer trail bike, but I’ll take that for the increased pop and feel over 95% of the terrain that I ride. It feels like there is way more grip, which makes sense with the larger wheels. Cornering is definitely one of the main areas where I feel the difference in wheel size, and it’s going to take some getting used to. I’m still trying to learn to trust the level of grip that it has, and I’m sure there is a lot more speed to come as I work that out. Once I feel like I’m getting to grips with the bike, then I’ll have a go at some suspension tuning to see if there is some more performance available there. I’m keen to have a go with a Quark Shockwiz as I’ve heard good things about them, but also to follow the bracketing approach that I discussed with Jordi from Fox back in episode 7 of the podcast www.downtimepodcast.com/jordi-cortes/. It already feels great, but you never know what you might find if you take a bit of time out to do some set up work! So, would I recommend a Flare MAX? The easy and short answer is YES. 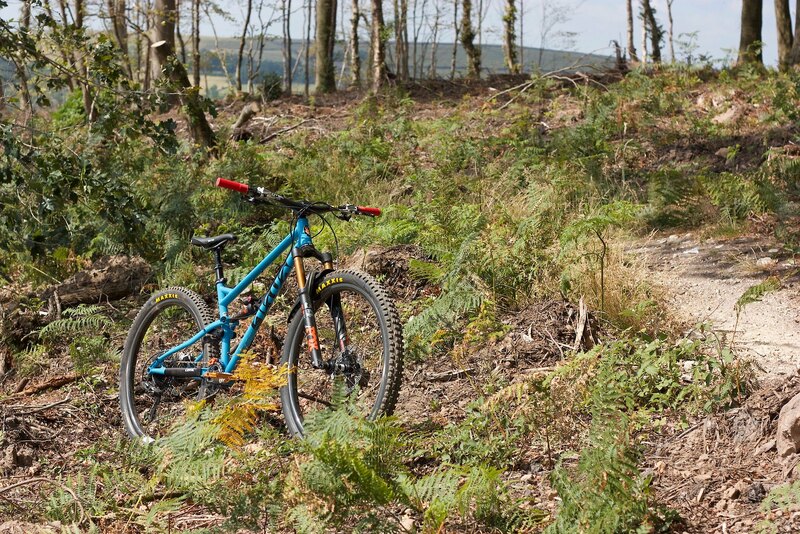 If you’re looking for something that’s fun to ride, playful and lively on the trails, but able to keep pace with a 160mm travel enduro bike on all but the roughest of trails, then look no further. It’s also a beast on technical climbs, allowing me to get up trails that I’ve never cleaned before, finding grip where it doesn’t feel like it should be possible. If you’re reading this then you’ve probably already decided that you don’t need the weight weeny savings that you could find with a carbon bike (weight can be useful, check out episode 22 with Jack Reading www.downtimepodcast.com/jack-reading/), so you may well be trying to choose between the Flare MAX and a Rocket or Rocket MAX. If you want to race enduro, and need to be able to hit super rough terrain at max speed, then a Rocket or Rocket MAX is the bike for you. However, if you’re willing to accept that over the really rough stuff you won’t be at race pace (you’re still not going to be slow! ), and riding for you is more focussed on having a great time in the hills with your mates, then the Flare MAX is the one for you. Seemingly effortless speed, confidence inspiring geometry, and a lively, playful ride. It works for me, and I can’t wait to spend more time on this amazing bike! If you’ve got any questions about the bike or any of the components that I’ve chosen, then feel free to drop me a message on Instagram or Facebook, I’m @downtimepodcast on both. Or drop me an email to chris@downtimepodcast.com.